Welcome to the exciting new concept in outdoor living and entertaining. 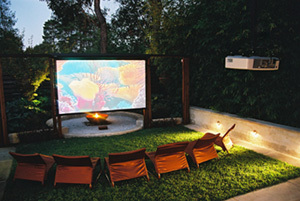 Landscape Design and Audio Visual expertise have combined to provide you with the ultimate cinema experience. What better way to spend an evening than with friends watching a movie or sporting event on your very own outdoor screen! Modern life request more of our spaces or rooms than ever before. Our inside rooms need to be multi-functional. The modern garden is no different. The line between inside and out has now been completely blurred allowing us to use our outdoor spaces in ways once never thought imaginable. With the advancements in outdoor lighting our gardens have become new entertaining areas. Now's the time to take that entertainment to a new dimension with the incorporation of a fully automated cinema system designed and installed in your outdoor space. Our research and development allows us to offer the latest technology to enhance your viewing and listening experience. Fully Automated Projection Screens, 6.1 Surround Sound and the latest advances in Projectors. If you would like to transform your new or existing outdoor space to incoporate this amazing feature please contact us for an appointment. We offer our design, consultancy and installation service Australia wide. Take your outdoor space to the ultimate dimension.